I have been waiting for these polishes to come out forever it seems like, and I really wanted them all but I only chose 3. I got L-R Beyond Jealous, Rich, Dark, Delicious and Dry Martini. I felt like I own many others like the other 3. I also stopped by the store to get some contact lens solution and some candy lol. Oh speaking of candy, if you have not tried these new peanut butter and jelly M&M's you are missing out!! It has a strawberry jelly flavor candy coating, the m&m chocolate, and the center is peanut butter. Soooo good. I will show you picture of the package later. I get home and there was a package on my porch! I almost pooped myself. Good thing I didn't. Outdoors. Rule Breaker is a blue-green (teal) shimmer. This color is very opaque and I am wearing 2 coats. I love it, my hand just naturally gravitated towards this bottle for my first pick! I also tried the 0-60 second top coat that this collection came with. "This super fast drying, shiny top coat will dry the top layers of your manicure or pedicure in 60 seconds! Durable and chip-resistant formula - great for all nail types." I think I was supposed to wait before putting it on ( I am a die hard Seche Vite user) I applied this immediately after my second coat. After 15 minutes some of my nails are still a little tacky and others feel dry to the touch. I will be more patient next time. The one on the far right is missing it's label, Yule Love It =x. The others L-R Clear Topcoat, Wonderland and Under The Mistletoe. I cannot wait to dig into these! L-R Abracadabra (Hocus, Pocus! lol Bugs Bunny anyone? Anyone? *crickets*) Master Of Disguise, Taboo and Ghost Of Chance. Ooooh! 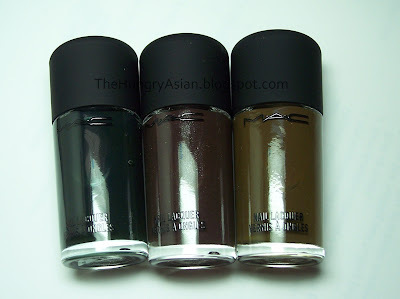 *stares* Those are the three MAC polishes I would have picked too. As to the M&Ms, have you tried just the peanut butter chocolate? Those are YUM too! Wow. I thought I could skip Rule Breaker but I just realized I may have to have that one. I want all of those Color Club goodies! Oh, my goodness. They're all so pretty. All those polishes look amazing! I'm especially excited to see Taboo! Very nice! The Color Club looks so pretty on you. I love MAC polishes, although I often hear complaints from others. Can't wait to see them on you! 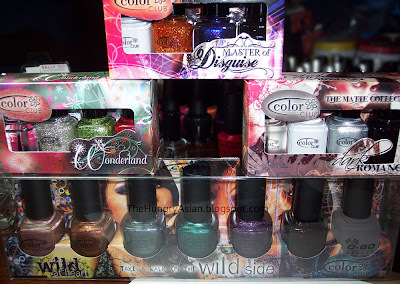 These are awesome polishes, I can't wait for swatches!! Hi Danielle! lol :) I want to do a halloween mani with abracadabra! Pizza was delicious! lol yeah I know your tastes by now! I have never tried those m&ms, will have to try them next time. ;) maybe something for your exchange list! oh speaking of wh ich I can't wait til the draw so I can go shopping!! thank you, I personally love MAC polishes. I know I've read the same negative things about them but oh well to each his own. I have been fantasizing about the Wild at Heart collex. Where did you get them from? Squeeeeeeeeeee! All of them look like fun :) I'm not sold on the MAC collection though. I'm not sure what I'll do about that! I will swatch Taboo next!! Color club makes great polishes, I like their formulas and they have a nice brush. I'm definitely ordering all of them. Such beautiful glimmers and colors. The Mac I don't know about. I had them ordered and had to cancel them because of a problem with my bank card. What a pain, I have to go to the bank and get another one. A problem of suspected fraud with a vendor that I dealt with. I would like to know who and why I wasn't notified! well I hope it was just a false alarm and not real fraud and gets worked out!